Located on 16th and Ocean Avenue, just steps away from the beach and boardwalk, sits the Sandpiper Motel of North Wildwood, NJ. Providing fun and a comfortable place to stay for families and people of all ages, Sandpiper Motel features special events scheduled throughout the season. With Wildwood’s award-winning Boardwalk attracting visitors from all over, Sandpiper Motel needed a newly redesigned WordPress website. Visitors will now have a better user experience with Sandpiper Motel’s redesigned WordPress NJ website. Created on a WordPress platform, the website is fully customized to meet the Sandpiper Motel’s needs. Newly added features include an interactive reservation form for guests to fill out, integrated social media, and a photo gallery containing a detailed description of all rooms available. Family Specials are conveniently displayed in table on the website, which the client has full updating capability of. Sandpiper Motel’s new WordPress website needed professional photography to display on it. Utilizing Market3’s in-house photographer, new images were taken to freshen up the site. 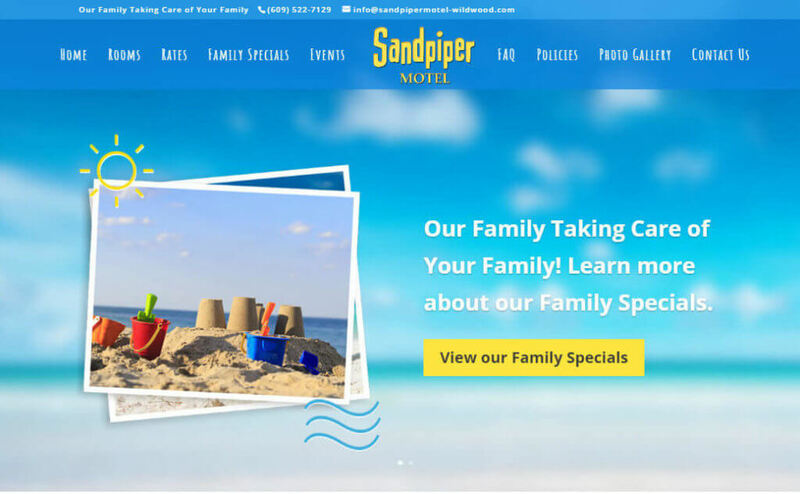 Sandpiper Motel’s staff has full capabilities to update their new WordPress website thanks to a content managed system (CMS). New photos, videos, and content can be updated at any point by the client, eliminating the need for risky proprietary software. In addition, Sandpiper Motel’s website is mobile-friendly, allowing visitors to view the site conveniently from all iPhones, smartphones, and tablets.